Great service, great price and live tracking for delivery. Also great customer support for technical questions. Brilliant fast and secure service!! Many Thanks. Excellent product, service and price. Highly recommended. Would be 5 star, only let down by DHL. Paid extta for a Saturday delivery only to be told delivery delayed till Monday. Does exactly what is says on the tin. It's a battery, it fits, it was reasonably priced and delivered on time. Great. Excellent product .really pleased good communication with sellers prompt delivery. Recommended. This battery doesn't need a review as it's the best in the business. Tayna were excellent in getting this battery to me and even made a courteous call the day after order was placed. I bought this battery for my Ducati 748 biposto. It is the one listed on the website. Unfortunately it is about twice the size of the original one so doesn't fit. So... If you want a battery for the above bike do not buy this one. 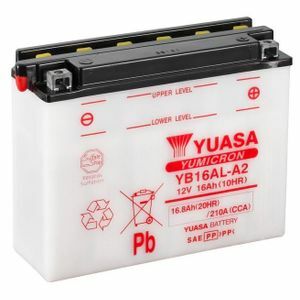 Instead buy a YT12B-4 Westco Motorcycle Battery 12V 10Ah because it is the correct size. Great service. The battery arrived quickly and was the correct one. Everything is working well at the moment. Fabulous service, delivery next day. Battery was what I excpected and was to replace the same model I had used for over 10 years. SUPER.